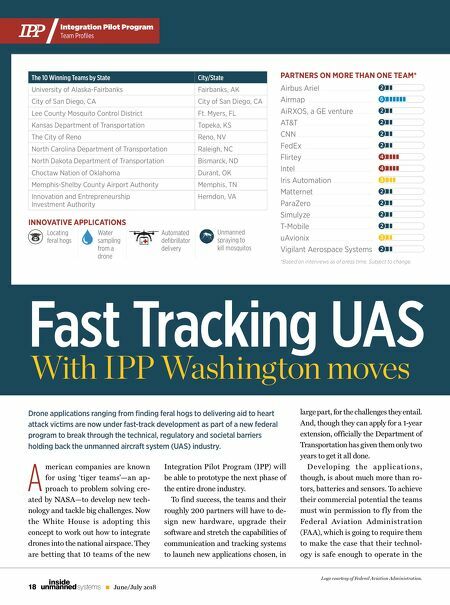 19 June/July 2018 unmanned systems inside P P IP Integration Pilot Program Team Profi les Integration national airspace. What's different is the FAA is not waiting to see what the teams come up with but is directly in- volved from the beginning. The agency is assigning staff to every team to both help them work through the require- ments and to learn along with them as things progress. The goal of the regula- tors is to use this view into the day-to- day guts of development to help craft practical new rules for an industry straining to be cut loose. Moreover, by design, the teams are led by state, local and tribal organizations— by Dee Ann Divis effectively giving the general public a huge say in how things are done. These government organizations are hoping to gain an economic leg up for their com- munities while finding better solutions for local problems like traffic backups. 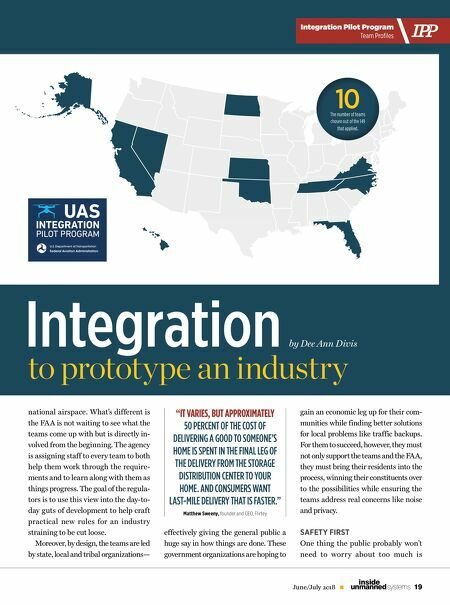 For them to succeed, however, they must not only support the teams and the FAA, they must bring their residents into the process, winning their constituents over to the possibilities while ensuring the teams address real concerns like noise and privacy. SAFETY FIRST One thing the public probably won't need to worr y about too much is to prototype an industry "IT VARIES, BUT APPROXIMATELY 50 PERCENT OF THE COST OF DELIVERING A GOOD TO SOMEONE'S HOME IS SPENT IN THE FINAL LEG OF THE DELIVERY FROM THE STORAGE DISTRIBUTION CENTER TO YOUR HOME. AND CONSUMERS WANT LAST-MILE DELIVERY THAT IS FASTER." Matthew Sweeny, founder and CEO, Flirtey 10 The number of teams chosen out of the 149 that applied.